At first glance, “Darkness at Noon” would not be considered a literary masterpiece. It’s a seemingly simplistic story revolving around a man, shackled by his ideals, who is thrust into a jail cell. However, as the story unwinds, so too does the mind of Rubashov, the former Russian political head of the Communist Party. The book’s dialogue is truly poetic (something that I was surprised to find – given the book is loosely based on real life), and the message foreshadows the state of the world we now live in. Themes can be compared to the commercial machine, and how others will always pick up the pieces after their brothers or co-workers fall - forging ahead, sometimes with little knowledge of where they are going and why. 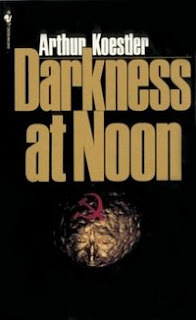 The book gives you a different understanding than futuristic novels such as “A Brave New World” and “Nineteen Eighty-four.” While those novels portray the rigorous controls placed on society, “Darkness at Noon” delves more into the mind of the men leading the political charge and the inertia that is displayed regardless of leadership changes. The book is truly a masterpiece. Koestler let his ideas stew within his mind when he was a political prisoner, and as such, they are presented with extreme clarity. While sometimes this dialogue is thick, it always contains extreme purpose. I strongly recommend this book to anyone who wishes to find insight, not with war or political pressures, but with the world around you. Where the "Nick was right" comment? Thanks Shannon... enjoyed your review as well! I have no idea what Nick was right about. I do know, however, that for two months in a row, Nick has brought a first edition. I can't wait to see the first edition of Frankenstein.